The keel and rudder arrangement was also constrained by the intended use for the boat. In the Foveaux Strait and Stewart Island area, dealing with floats and lines on the surface is not uncommon, especially when picking up cod or crayfish pots. This prompted for extending the keel underneath the propeller and bridging the gap to the rudder post. This setup, inherited from commercial fishing boats, usually allows steaming on top of a floating line without catching it in the propeller or rudder. The rudder shown above was significantly modified at construction – and then partly altered back – in ways influenced by commercial fishing. The trailing edge should be clean and the gap with the hull should be minimised. 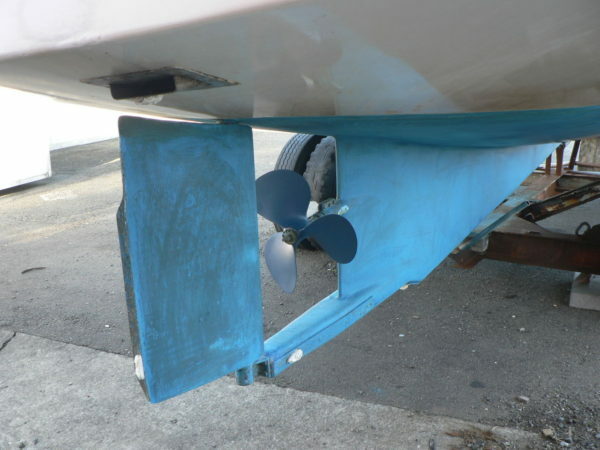 If a rudder flap is desired for a tighter turning circle, there are better way of achieving it. The exhaust outlet slot should be faired in and not protrude in the flow; it is otherwise a good arrangement in the sense that it discharges underwater while underway. The keel girder was designed to support the hull out of the water. This makes hauling out or drying up on a ramp so much easier and the penalty, in terms of wetted surface, is very small. A metal strip can also be fastened underneath to protect the laminate. On a larger, blue-water version of the design, one would potentially consider an internal keelson and hung spade rudder(s) as the focus would shift more towards deep water and passage-making, but the options retained here are highly practical and adequate. Propulsion uses a simple straight shaft design, at a very low angle. It is most reliable, simple to build and has the lowest maintenance cost of all available alternatives by far. Attention was paid to providing a good, clean flow of water into the propeller and sufficient clearance between propeller and rudder as well as the blade tips and the hull. The pressure spikes from the pulsation of the propeller need some distance to even out and the rudder foil operates best in a steadier stream of water. Powering requirements are very modest. A speed of 8 knots is readily achieved with about 18HP only, including all losses. Assuming we want to be able to push up to the 9-knot mark or beyond at times, most marine diesels rated between 40HP and 75HP are highly suitable, choice should be driven by the effective intended operating point: small marine diesels are not normally rated for continuous duty. The design was optimised for long range or low-cost operation rather than top speed; a number of optimisations could be considered to reduce power requirements near the top end, but a better answer here starts with a longer hull. The last two knots remain expensive in relative terms. At speeds above 9 knots, the power curve already starts flattening out as dynamic lift is produced. Such speeds are readily reached in following seas without the added expense of power shown. In fact, the hull tends to travel at the speed of the wave train and limited engine power only is consumed to stay ahead of the crest, even for very low waves. Average speeds of 12.5 knots were recorded over long distances at times. One hilarious scenario takes place when the boat is chased by larger vessels that are pushing a lot of water: as they catch up from behind, the pressure from their bow wave gets underneath the transom, the boat starts riding it and… unless they can still find a lot more speed, they are unable to pass. The hull seems to benefit from wave action in a variety of settings, including beam seas, where it alights from the crests, and outperforms the flat water data. The boat pictured on these pages is powered by a marinised Nissan LD28 engine, which is allowed to develop up to about 60HP in this application through a 3.0:1 hydraulic gearbox. The LD28 is one of the few small straight-six engines commonly available and, as we know, the straight-six naturally offers a perfectly balanced configuration, making for very smooth running. A partial kit also exists for marinising them. Operating an engine lacking a governor has shown to be an advantage in some conditions as it is able to rev up as the load comes off the propeller with boat speed increasing. When a governed marine diesel would cut fuel back to maintain engine revolutions, the ungoverned engine accelerates with the boat and keeps pushing it along. This is not a necessity at all however, merely an interesting observation and there have been no drawbacks to the absence of governor on the LD28 in this application. However, in my experience, there are seldom any gains to be found in marinising vehicle engines for use in boats when compared to installing a proper marine engine. Comments or suggestions? Go to the Wild South discussion.